I have never taken a yoga class in my life. I’m serious…..I have done some stretching exercises via YouTube videos, but I haven’t taken a formal class. I’m not opposed to it or anything; I just found it a little too slow paced for me. But when I heard of TrapSoul yoga (trap music + yoga) – I thought, that might be something that I can get into! TrapSoul yoga is presented by The Villij – an online storytelling platform started by Kim Knight and Shanelle McKenzie. The purpose of their site is to tell stories of people of colour by using our own voices. They post stories online, conduct interviews, and produce visual content, but they also want to connect with people offline. They chose to do so by hosting events. TrapSoul Yoga is their very first event and it has already proven to be insanely successful. The event debuted in Montreal and received rave reviews. The yoga attendees loved it so much that they are begging for another event! Guess where the next stop will be? Yes, TrapSoul Yoga will be headed to Toronto on August 20th (location: 619 Yonge Street), and I was lucky enough to find out more about this event from Kim – one half of the creators of The Villij. Check out the deets below. Shanelle and I do yoga and we shared similar experiences in that the space really didn’t always cater to us. We never had an instructor of colour and usually when we go to the classes, there are very few women of colour. 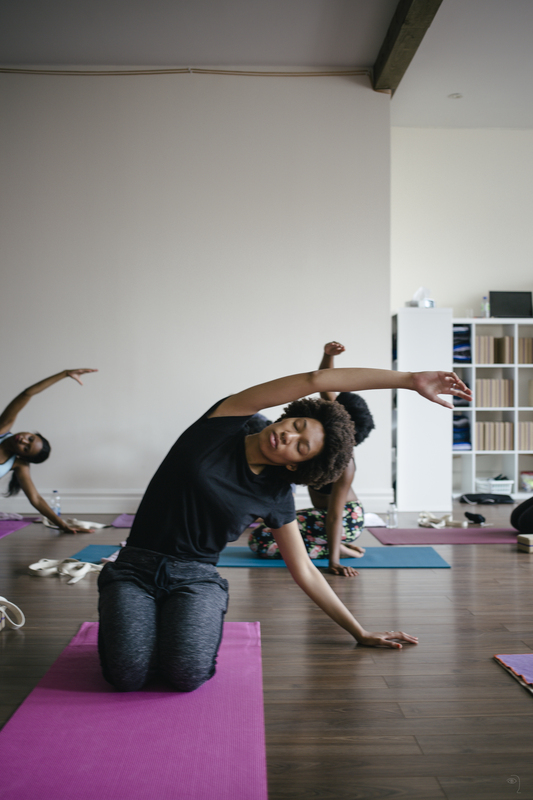 We wanted to challenge and tackle that because we know that there are a lot of people of colour out there who are into yoga as well as there are people of colour who’ve NEVER tried yoga but always wanted to. We decided to create our own space and to have an event where we allowed people of colour to have a chance to be vulnerable, be themselves, and feel comfortable. That’s how TrapSoul yoga came about. The whole aspect of TrapSoul – well, that’s pretty much the music we generally listen to, so we wanted to incorporate it into the classes. It is a 75-minute Hatha yoga session instructed by Nadia Walters (she’s also the founder of a hip hop yoga class and has been instructing classes for 10 years). What makes TrapSoul yoga different? The music is different and we also feature sponsors that are people of colour. For the Toronto event, we’re having a TrapSoul Refresh lounge sponsored by Tib Tib House of Tea – created by a young lady from Toronto who started her own East African Chai Tea company. She donates part of her profits to an organization in Ethiopia. For our first TrapSoul yoga, we opened it only for women, but we are looking to include men of colour too. Sounds interesting, right? To find out more about this fun new way to yoga, check out the sites below. Psst – if you miss this event, Kim shared that they plan on making it a reoccurring event, so hopefully you can make it to the next class!